Our Direct Attached JBOF Storage appliances allow you to expand your current storage pool with enterprise-grade flash storage via NVMe Over Fabrics. Connecting storage nodes over a fabric allows multiple paths to the JBOF applaiances storage resource. It also enables concurrent operations to distributed storage, and a means to manage potential congestion. 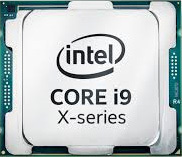 Further, it allows thousands of drives to be connected in a single pool of storage, since it is no longer limited by the reach of PCIe, but can also take advantage of a fabric technology like RoCE or Fibre Channel. Our Direct Attached JBOF Storage appliances enable you to expand your storage pool with enterprise-grade storage. The CyberStore JBOF appliance provides the next evolution of performance, storage capacity and flexibility to your data centre. 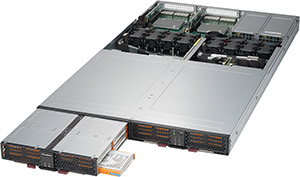 With up to a petabyte of storage capacity in a 1U, 52 GB/s of throughput and connectivity for up to 12 hosts, the latest JBOF platform is the excellent addition to any mission critical application. Delivering super-fast performance, these enterprise-grade JBOF appliances are designed to handle everything you throw at them. The NVMe storage enclosure is high density and high capacity. The appliance supports up to 32 NVMe hot-swappable SSDs, features tool-less modular design and individual SSD power cycling. JBOF has the capacity of up to 1PB of storage per 1U of rack space. The storage appliance is capable of up to 52 GB/s data transfer rate and has the flexibility to configure up to 12 hosts or with NVMe oF AOC. 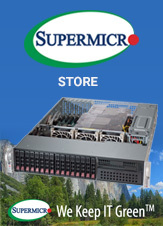 Configured with the Mellanox BlueFieldâ¢ SmartNIC network adapter the CyberStore JBOF appliance combines processing power with advanced network offloads to speed up a number of security, storage and networking applications. 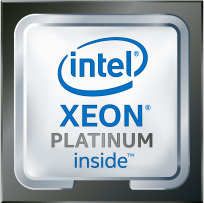 Delivering world-class efficiency, flexibility and performance. In addition, as BlueFieldâ¢ SmartNICs are software-defined adapters, they ensure the utmost flexibility through adapting to future features and protocols through a quick and simple update. 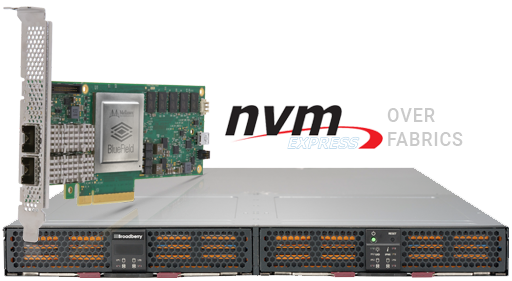 NVM Express over Fabrics defines a common architecture that supports a multitude of storage networking fabrics for NVMe block storage protocol over a storage networking fabric. Including the enabling of a front-side interface into storage systems, scaling out to large amounts of NVMe devices and increasing the distance within a datacentre over which these devices and subsystems can be accessed. 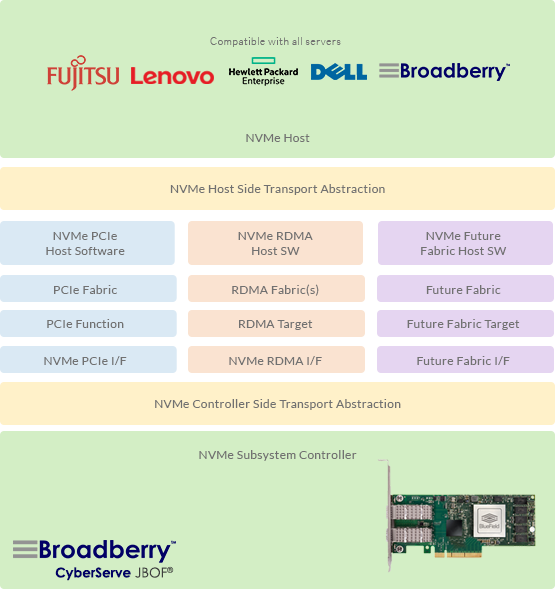 The NVMe over Fabrics specification is a recently advancement, with work on the specification beginning in 2014 with the aim of extending NVMe onto fabrics like Ethernet, InfiniBand and Fibre Channel. NVMe over Fabrics has been designed and built to work with any suitable storage fabric technology. The main aim of NVMe over Fabrics is to deliver distance connectivity to NVMe devices with no more than 10 microseconds of additional latency over a native device in a server. Up to 90% of the NVMe over Fabrics protocol is the same as the local NVMe protocol. This includes the namespaces, registers and properties, asynchronous events, I/O and administrative commands, power states, reservations and others. The main difference between local NVMe and NVMe over Fabrics is that the latter unlocks the full advantages offered by NVMe-enabled storage arrays. It offers the separation of control traffic and data traffic, which significantly simplifies traffic management. Overall data performance is improved and latency is reduced through NVMe oF taking advantage of the internal parallelism of storage devices and lowering I/O overhead. NVMe oF delivers a big boost in performance to enterprises that deploy applications that require real-time access to stored data, without any distance dependencies. 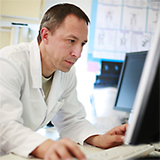 This includes machine learning applications, Internet of Things analytics and big data. When you order a CyberStore JBOF appliance from Broadberry, you never have to worry vendor lock-in. Leaving your business free to have full control in the changes you make to your new JBOF appliance. Our range of CyberStore JBOF storage appliances are can be configured to perfectly fit the requirements of your organisation. They are compatible with every major storage server software available on the market, a rarity in this field where most servers are locked into a single operating system. Broadberry's enterprise-grade solutions have been trusted to power some of the world's largest organisations. The CyberStore JBOF range represents a high performance, flexible and future proof option for competitive prices.